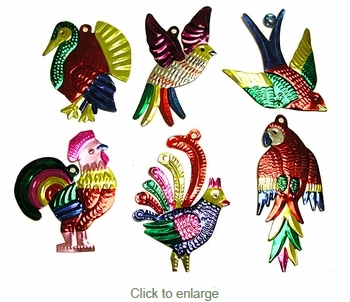 Painted Tin Ornaments - Assorted Exotic Birds - Per Doz. Our painted tin exotic bird Christmas ornaments are all handcrafted by metal craft folk artists in Mexico. The natural tin is hand cut, hand punched and etched, then painted one piece at a time. These Mexican ornaments are a work of art that will make a great gift for the holiday season or add a festive and colorful addition to your own holiday decor.